A couple of week’s ago the children from Scoil Mhuire piled into the hall to see the final of Scoil Mhuire’s Got Talent 2017. A huge number of acts had auditioned a couple of weeks before and these were whittled down to 14 finalists who put on a vast array of performances from dancing, gymnastics, singing to a video-enhanced performance! A very enjoyable afternoon was had by all. 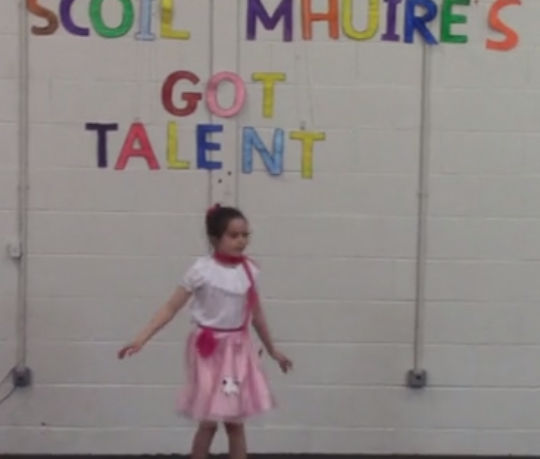 This year’s winner was Sophie Maycock from 3rd Class for her dance with Christine Okakpu the runner-up for her guitar playing and singing. Killian Gormley was in 3rd place with his visually stunning musical performance. Eoin Corcoran received this year’s merit award for his outstanding performance of a lesser known Ronan Keating song.